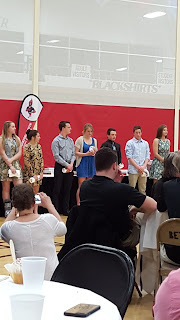 This past Wednesday, I attended the Waukesha South High School Scholar/Athlete awards banquet. It is a function to honor all the student athletes that were able to maintain a 3.5 GPA or better for the first semester of the 2016 school year. While I don't want to turn this into a gushing post about my kid, I do want to talk a little about what I saw and experienced at the event. For starters it was noteworthy that there were over 200+ students school-wide that were recognized. An interesting statistic noted by the soon-to-be-retired Athletic Director, Dan Domach, was that that number represented 61% of the student athlete population. So, sixty one percent of the athletes at South were able to keep up their studies and achieve a 3.5 GPA. This was a number that he was pretty proud of, rightfully so. 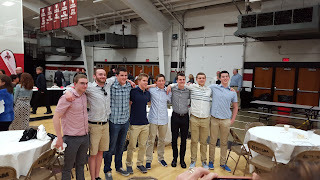 In order by grade, the scholar/athletes were awarded certificates, medals, T-Shirts and plaques from Freshman to Senior. Multi-sport scholars were also recognized as were some special award winners and leaders. I sat with some long-time friends who had a daughter being recognized. My son sat with his swimming buddies, as did groups of many of the other athletes. It seems teens still don't want to be seen with their parents, much like in my day. Which brings me back to my days in High School. My experience was so different than Ben's or Sarah's. I was at a private, military all-male high school. I was also a single parent child. With the exception of my brother Paul who played on the golf team, I was the only kid in the family that played in a high school sport. And even that was just my first two years in high school. Add to that the fact that I was a solid B student - a consistent B Honor Roll kid, but a B student just the same. Her perspective was a healthy one given her situation, in my opinion. In this day and age of competitive scholastics nothing less than an A or any class less than Advanced Placement is good enough. The fact that a B is still considered "above average" is lost on people stuck on the AP track. So, when I can honor my kid for doing better than I did, for doing something that we never pushed him to do, well it is one of my proudest moments. The same goes for my daughter who excelled as well, albeit outside of the athletic circles. I've said it before a thousand times, I don't know what we did to get such smart, driven kids, but it sure stuck. And the chance to see him there amongst his friends and hundreds of other "good kids" that will go on to make the world a better place, was incredibly motivating. With all the negativity in the world, it is refreshingly good to recognize the good, the honorable and the high achieving. Ben and the Swimming Scholars. At the same time, it was frightening and sad to know that in a little over a year from now, he will move on to new places, new friends and new experiences. They grow up fast. It's good to know they grew up right.